South Africa�s first single grain whisky, Bain�s Cape Mountain Whisky was named the World�s Best Grain Whisky at the annual Whisky Magazine�s World Whisky Awards (WWA) in London on 21 March 2013. Bain�s Cape Mountain Whisky became the first South African whisky to win the award, beating out traditional whisky-producing countries including Ireland, Scotland and the USA. The whiskies were assessed based on three blind tasting rounds, by an independent panel of judges that included some of the foremost international whisky palates. Andy Watts, master distiller of Bain�s Cape Mountain Whisky was on hand to receive the award at the London ceremony and said he was overwhelmed by the news. Distiller of Bain�s Cape Mountain Whisky, Jeff Green, said: "This isn't just a win for Bain's Cape Mountain Whisky but for South African whisky-making. �Bain�s Cape Mountain Whisky, launched in 2009, was created to express the extraordinary properties of South Africa�s very best home-grown grains, fermented and distilled locally. With a distinctive South African taste profile, the maize is the same as that which was imported into Scotland up until the mid 1980s to make Scotch whisky. Green says that South Africa's warm climate contributed to the excellence of its whiskies. He explained that the maturation process was accelerated by the faster interaction between wood, spirit and air to produce whiskies of great smoothness. "Essentially, the higher ambient temperatures mean our whiskies reach maturity at a younger age." 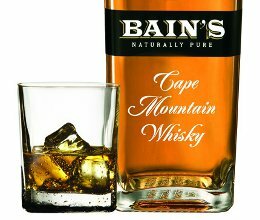 Bain�s Cape Mountain Whisky is uniquely double-matured to allow the maximum interaction between the cask and whisky. The whisky spends three years in specially selected ex-Bourbon casks and is then re-vatted for a further two years in a fresh set of casks, resulting in attractive toffee, floral and vanilla aromas softened by sweet, spicy undertones, with a warm mouth-feel and a smooth finish. Bain�s Cape Mountain Whisky is available from leading liquor outlets and retails for approximately R200 per 750ml bottle. 11/04/2013 17:25 - Distell says 2013 is going to be a great vintage!